I would say that primarily I am a lover of landscape painting, particularly plein air/on location. The more years I paint, the more fascinated I am by the power in a simple still-life. Most recently I have resolved to tackle the complicated world of portraiture. Originally from Chicago IL, my life has been pretty much split 50/50 between Rochester NY, and Honolulu HI. With a few years in Boston MA and the last few years in New Orleans LA. I grew up playing under my mothers sewing table surrounded by colorful fabrics and craft projects. She was an amazing quilter who never got rich, but showed me how happy you can be doing what you love. My father is among other things a gunsmith who restores antique firearms. He taught me that almost anything can be fixed or figured out. When I felt like I would never be able to paint clouds the way I wanted to I approached it that someone somewhere figured it out before me and I just had to do the same. 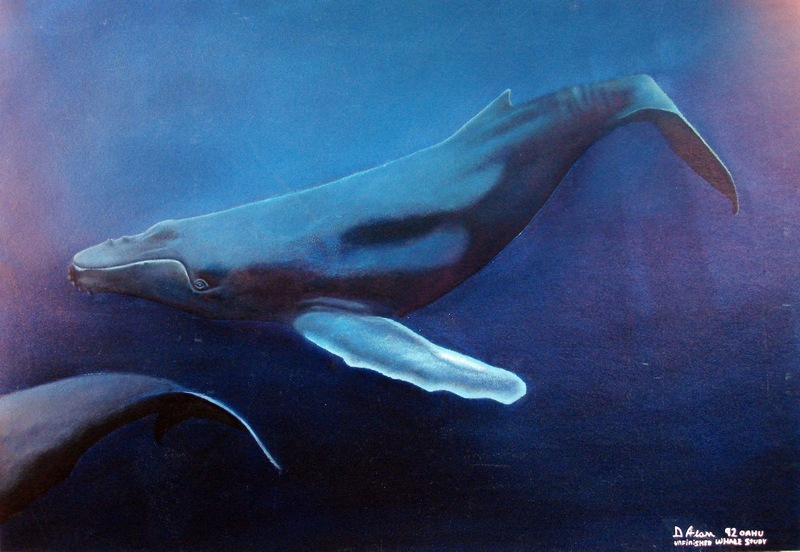 My early NY art education was pretty much “anything goes” with few boundaries. I studied all areas of art including art history. We were encouraged to paint on a garbage can lid if we wanted because there was supposed to be no such thing as “bad art”? While I found this to be fun and freeing it did little to give me a foundation for the kind of art I wanted to be doing. Disillusioned by my artistic choices at the time I detoured into the still creative world of cooking. I had been paying the rent as a lifeguard, lifeguard instructor, first-aid and CPR instructor throughout high school and into college. One semester I had somehow ended up as the “fry-boy” making buffalo wings, in Buffalo NY, for the Buffalo Bills. Having this on my resume when I went to apply for a life-guarding job at the best hotel in town landed me an interview with the Head Chef. He had just fired two people on a busy Saturday night and was desperate. He handed me a chef's jacket and put me right on the line telling me to watch and learn, helping out where I could. I kept coming back and being the only one without even a two year culinary degree worked in my favor. When others where preparing a dish exactly how they had learned it in school I was free to experiment and try new creative ideas. These ideas luckily usually worked out and I quickly ended up head of my own department overseeing large wedding parties, buffets, and having the chance to cook for numerous celebrities. It was a fun job but it still was not painting so I left to try and see some of the world before getting too tied down in any one place. So I headed off to London with $500, a backpack, and a tourist visa. Just the kind of craziness you can only get away with in your twenties! I ended up working for a year as the travel chef for a Saudi prince. That one year might fill a book someday but the important thing was that it gave me free-time in one of the worlds best cities. A few times a month I would wander through the National Gallery. I picked one or two rooms at a time and really studied my favorite paintings. I questioned what it was about each of them that caught my eye, and held my interest longer than the others. It was a priceless self education and period of reflection. This re-ignited my love for art and focused me in on the fine art of oil painting. Returning to the US I moved to Hawaii and decided to go back to school. This was surprisingly the back to basics, learn from the knowledge of the past type of art education that I had been originally looking for. I found myself painting in a very tight illustrator style that it took years to break out of. Thinking I knew it all I was shocked when a professor recommended I take a course in color theory. I knew that blue and yellow made green so what else was their to know? It comes as a surprise when you realize how much you did not know when looking back. I spent years doing other side careers like carpentry and landscaping. All creative outlets but never getting much more than a painting a month done in my spare time. 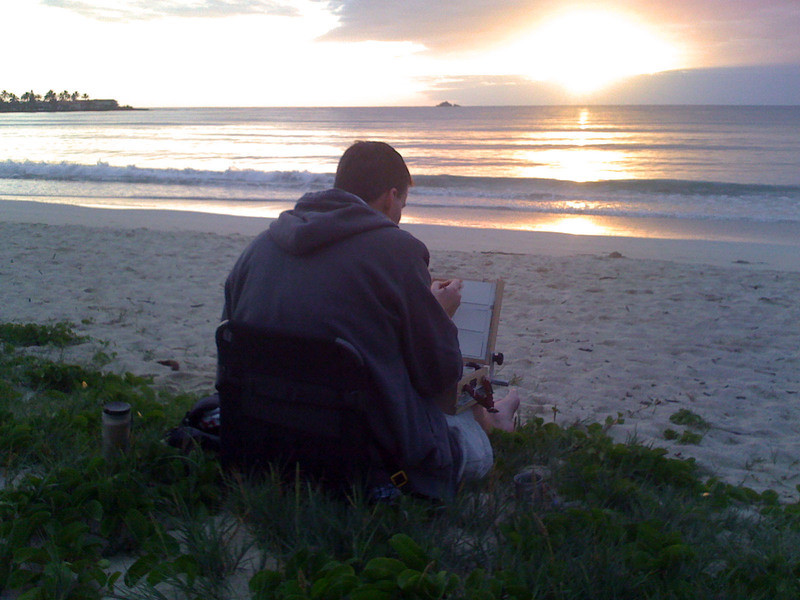 I had always considered myself an “artist” even though I was earning very little from what was really just a hobby. Landscape design took me to Boston for a few years. Great city but a very cliquish art community. I painted the least I had since leaving school during this period. An early mid-life crisis had me walking away from it all knowing that if I did not I would never get around to being the painter I wanted to be. I moved back to Hawaii and it's more receptive art scene. Joining the online Daily Paintworks group finally got me to be an almost daily painter no matter how busy I was. I also started painting smaller and smaller eventually getting down to doing Artist Trading Cards at only 2.5”x3.5”. These little gems teach you to make every brushstroke “count” since there is only room for a few of them. I spent a lot of time doing plein air, outdoor painting, which taught me to not just throw down some doodles hoping to fix it later but to visualize in my head what the finished painting should look like. This faster pace led to real improvements in the style and quality of my work. It is my number one advice now for new painters. To go out and buy 100 cheap, small panels and just fill them up. When you get to the end you will be amazed by the progress you have made along the way. It was around this time that I finally got serious about having painting be what I do with the rest of my life. It was also around this time that I had the first of several skin cancer operations. I have had a ton of the regular actinic keratosis that everyone gets frozen off but I have also had several basal cell carcinomas pop up over the years. The first few were large and on my neck. After they started operating they realized that it had grown around the nerve that allows me to lift and therefore paint with my right arm. If I had been older they would have removed the nerve but spent a few extra hours operating to make sure they could save it. I am very grateful for what they did and glad to have gotten the do not take painting for granted wake up call. 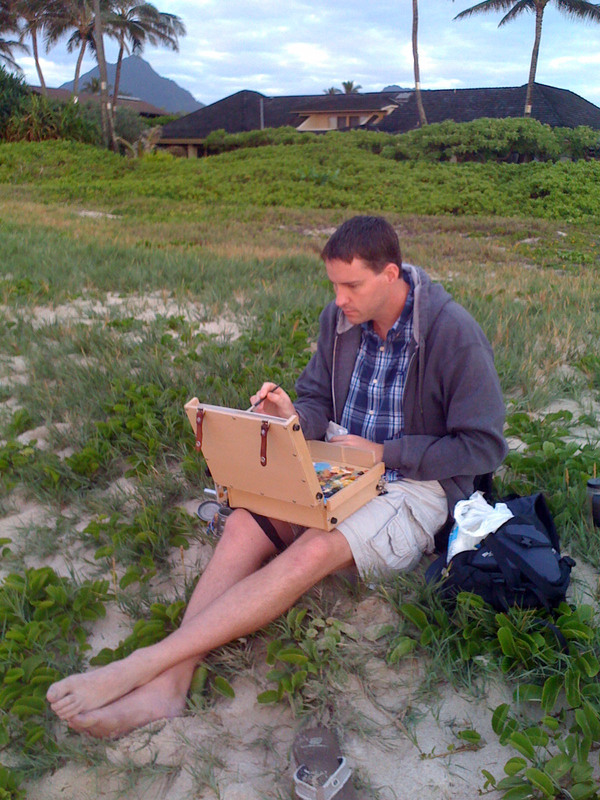 Hawaii landscape painter Lynne Boyer was my first real art workshop and I picked up a lot. I set a goal of attending one workshop a year. My next was with Qiang Huang and it had me go in a whole new direction with my still-life painting. This workshop took me to Putney, VT the picturesque home of the Putney Painters. 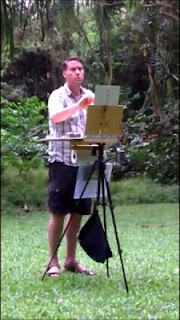 Our special last day of the workshop was a painting demo by my favorite artist Richard Schmid. In one day I learned more from him than in all my years at school. He really knows how to teach what everyone else has left out. My focus had always been landscapes and still-life paintings because figures and portraits were so hard that I thought I would never get it. Thanks to two back to back workshops with the amazing Michelle Dunaway I finally feel like there is a light at the end of the tunnel. 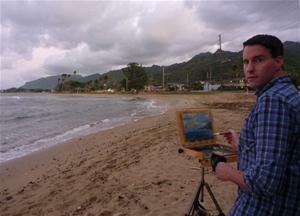 While painting in Hawaii I was also working full time on Kaneohe Marine Corps Base at the Enlisted Club. This was where I met my now husband Brandon. That is another long story for it's own book someday. We knew each other for years but were just friends until we fell in love during long letters written back and forth during his last deployment to Afghanistan. When he finally came home he jumped into my arms for our first kiss and a picture was taken that quickly went around the world.